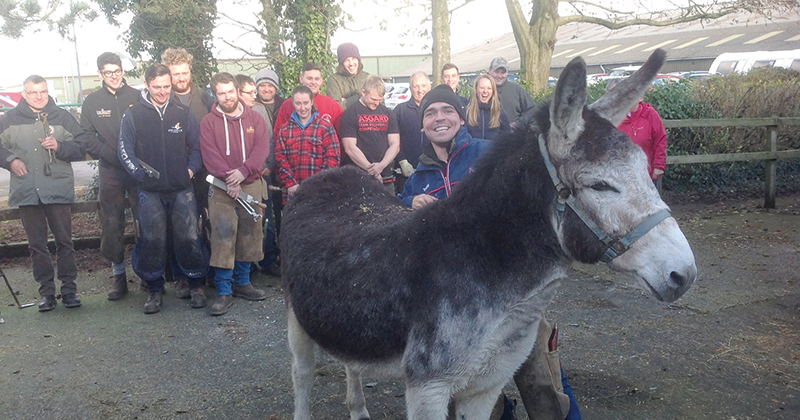 Farriery apprentices have had a lesson in caring for donkeys’ feet during Myerscough College’s annual Donkey Day. Experts from the Donkey Sanctuary in Devon joined the hoof-care students for a workshop on how to trim donkeys’ feet, which differ greatly from horses in the way they grow, before letting them loose on visiting donkeys from the neighbouring town of Blackpool. The senior farrier from the sanctuary, Colin Goldsworthy, delivered the workshop to the learners accompanied by veterinary surgeon Jo Goliszek, and the local sanctuary coordinator Pam Moon. It is the twelfth year running that Mr Goldsworthy has given talks on trimming donkeys’ feet to Myerscough students. “We always get a warm welcome here. We’re looking forward to our next visit,” he added.